Starnberg, the green oasis before the gates of Munich, “the city with heart” is where our apartments are located. The historical Biedermayer house is situated near the town-centre on a quiet street. Very nearby is Lake Starnberg and the historic Castle of Starnberg, one of the most important and well-known sights. 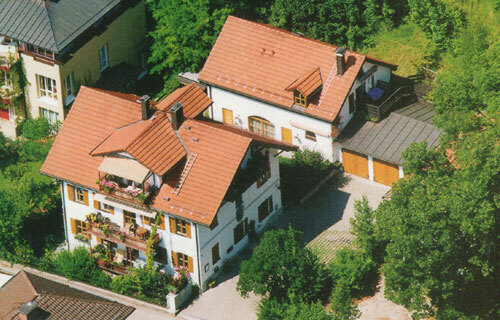 Continue reading and learn more about the location and history of the house a swell as Starnberg itself. The “Appartements am Schlossberg” comprise and old Town-house from the Biedermayer era. The property was earlier owned by Michael von Hastreiters, then the physician of Prince Carl of Bavaria. Two buildings form the central port: on the street there is the main house with ist representative facade, behind it the outbuilding, which accommodated servants as well as horses and carriages. In 1992 the premises were completely renovated with special attention to preserving the historical aspects of the building. Since its acquisition by the Kühnel family in 2013 all of the interiors were modernized to the highest comfort standards. The apartments are located in a quiet side street not far from the Starnberg town-centre, where you will do most of your shopping during your stay. Only minutes away on foot is the commuter train to Munich, thus offering from our apartments the relaxation of a small Bavarian town coupled with excellent access to the South German metropolis. The baroque gardens of the castle just nearby allows you to completely relax and take in the beautiful view of the complete lake before embarking on a promenade along he shore where you can explore the diverse possibilities,for good eating or the cultural scene, e. g. the castle grounds from the 12th and 13th centuries, St. Joseph church from the 19th century or the Heimatmuseum. The attractiveness of Starnberg comes from its extraordinary scenery, cultural diversity and gastronomy! Villas and castles next to the lake and mountains create a picture for the region, a composition combining live tradition and picturesque nature, making it a most popular destination in Upper Bavaria. The most distinctive and prominent sight is Lake Starnberg. It is is revealed particularly on sunny days with its waters sailed by numerous boats and ships and the Alps on the horizon presented in gracious manner. Together with the lakes in the vicinity - Ammersee, Pilsensee, Weslinger See and Wörthsee – the “Fünf-Seen-Land” (Five lake country) is comprised a region offering its visitors the whole year an unique cultural and natural experience. Starnberg offers its visitors not only beautiful countryside, but also numerous sport activities, exclusive shopping, and several places of interest concerning Bavarian culture. This is just a short extract of the rich leisure possibilities. More detailed information can be found in the guest guides in all of the apartments.